The Little House of Concrete Bookshelves: Colin Irwin "In Search of the Craic: One Man's Pub Crawl Through Irish Music"
British journalist Colin Irwin may have spent much of the seventies and eighties as assistant editor of Melody Maker and written about singer-songwriters, folk rock, and traditional folk for The Guardian, The Sunday Times, The Daily Telegraph, The Independent, Mojo and fRoots but his real passion, from what I can gather through reading In Search of the Craic lies in the traditional Irish music that might find its way from time to time into concert halls and major venues but is best sampled in the environment from which it emerged. 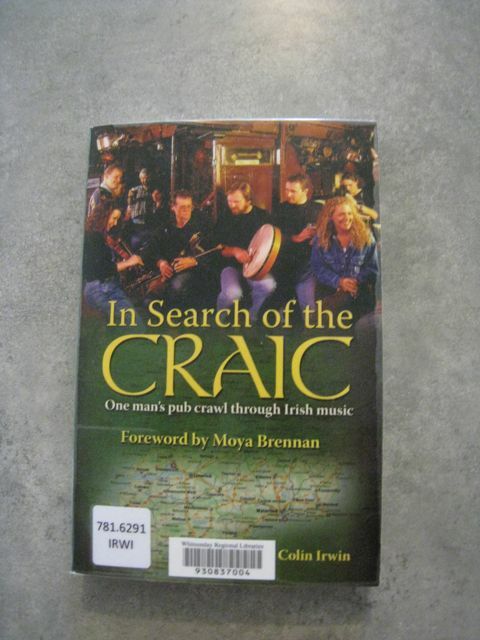 Doing that, at least as far as Irwin is concerned, involves an extended pub crawl through the back blocks of the Irish countryside with the occasional spell in a major centre and regular encounters with characters who may or may not be legends of the genre (though he tracks down plenty who are). 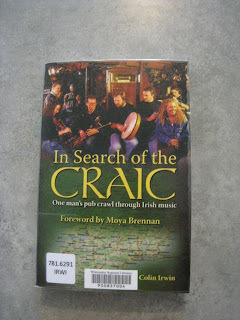 Late nights, early morning, the black stuff by the bucket load and an abundance of music provide the fuel that powers a book that's part travelogue, part music history, part whimsical observation and high on the Enjoyable Read Index. On the strength of this one I'd be interested in tracking down his In Search of Albion: From Cornwall to Cumbria: A Ride Through England's Hidden Soul though I think I'll be giving his biographies of Dire Straits and Abba the big flick pass.